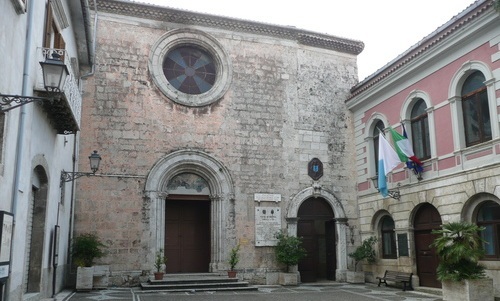 Isernia was one of two provinces in the region of Molise. 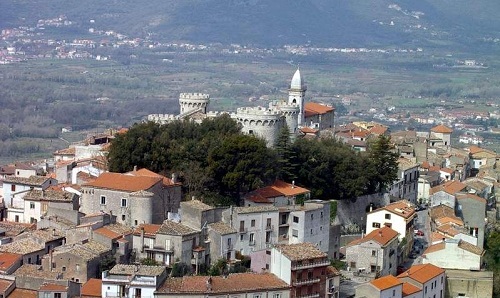 In 1970 Isernia became the capital of the homonymous province, created out of part of the province of Campobasso. It borders Abruzzo to the north (the provinces of L’Aquila and Chieti), the province of Campobasso to the east, Campania to the south (the province of Caserta), and Lazio (the province of Frosinone). The city's Roman name, Aesernia, reflects probably a former Samnite toponym, but a connection to an Indo-European root, aeser, which means "water", is tenuous. The first mention of it in history occurs in 295 BCE, at which time it had already fallen into the hands of the Romans, together with the whole valley of the Vulturnus. It encompasses 52 municipalities, only two of which have more than 10,000 inhabitants. Man and Biosphere program for the study of the relationship between man and environment, due to their high levels of biodiversity), the Garden of Apennine Flora of Capracotta, the Natural WWF Oasis “Le Mortine” of Venafro and the conservation-oriented natural reserve of Pesche. 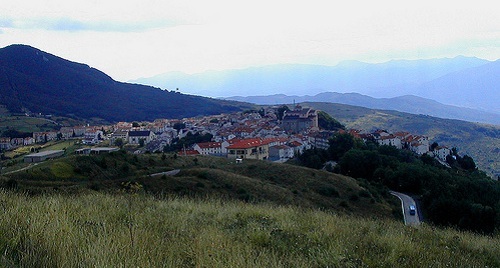 To the southwest, the mountains give way to hills and plains (the Venafro plain). A unique feature of the area is represented by the Tratturi, broad grassy paths of stone and gravel, created by the trampling of herds and still viable over long stretches. 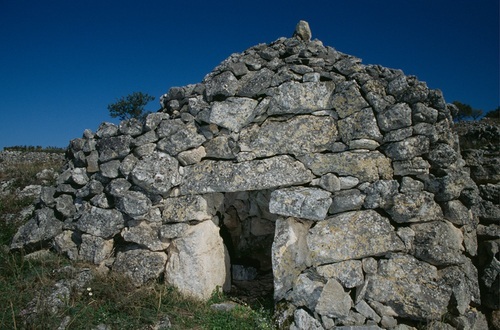 Today they are a protected archaeological feature. The province is traversed by several rivers and streams: the major river is the Volturno, which runs through the province and Campania before flowing into the Tyrrhenian Sea. 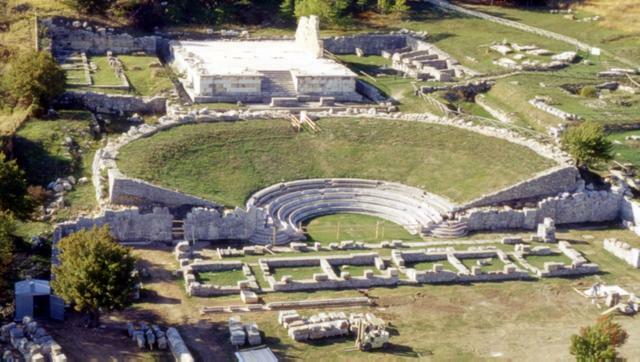 Although having been object of repeated destruction, Isernia preserves a large number of monuments of fairly good archeological interest. The territory, where the most ancient presence of man in Europe was recorded, can offer important signs of the presence of many civilizations: pre-historic settlements, Samnite fortresses, Roman towns, imposing medieval castles, Romanesque and baroque churches, as well as a natural landscape that for the uniqueness of the vegetation and wildlife is now included in parks and natural reserves. 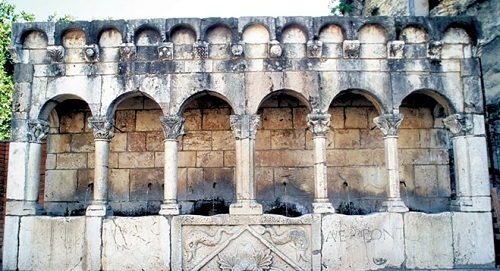 Numerous natural and man-made spectacles can be admired in Isernia, a fascinating place that should not be missed. 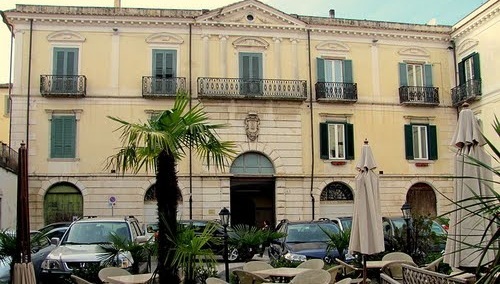 ...the Museo Santa Maria delle Monache, on the site of the former Romanesque convent of Santa Maria Assunta, where prehistoric remains of Paleolithic origin are conserved. Discovered in the neighbouring town of La Pineta, an archaeological site of international importance, are the remains of an ancient human Paleolithic settlement from more than 730.000 years ago. Still on the subject of archeology, the remains of a Samnite town dating from some time between the 11th century B.C. and 95 B.C. were discovered at Pietrabbondante, including two temples, porticos, shops and a theatre. There are also many other museums worth visiting in the province, including Archaeological Museum of Venafro, at the site of the former convent of S. Chiara, with a wealth of pre-Roman and Roman remains. 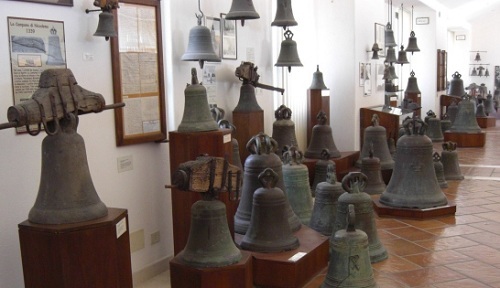 There’s also the Bagpipe Museum, traditionally produced in the area, at Scapoli, containing Italian and foreign bagpipes from different eras,..
the Museum of Popular Arts and Traditions in San Pietro Avellana, and the Bell Museum in Agnone, with its fourteen churches, some of great architectural importance, and valuable works of art. 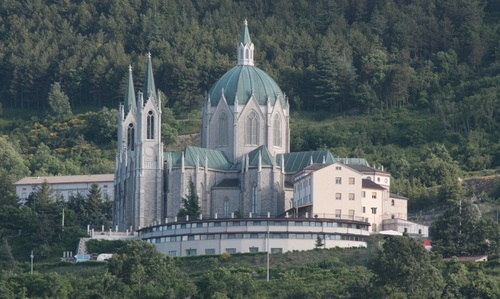 The province boasts the important shrine of the Santuario della Madonna Addolorata di Castelpetroso now stands in the place where, in 1888, the Virgin Mary reputedly appeared to two milkmaids. It is made up of seven chapels representing the seven sorrows of the Virgin, surrounding the centrepiece, a 54-metre high dome, all in neo-Gothic style. 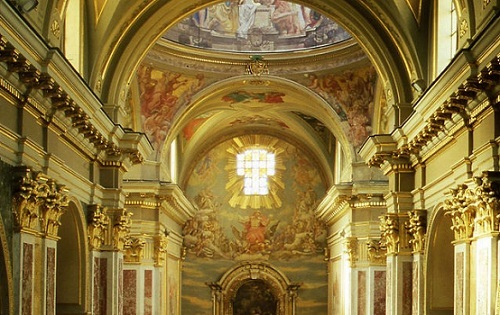 Another place of pilgrimage is the hermitage of Santi Medici Cosmo e Damiano, perched atop a hill near Isernia. 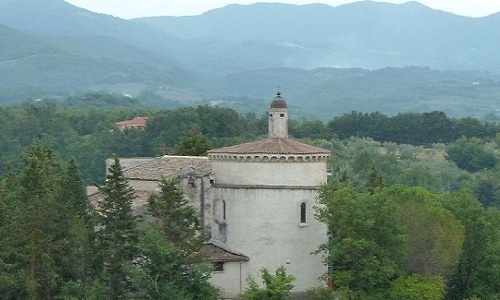 The medieval abbey of San Vincenzo al Volturno is also worthy of a visit. The province is rich in castles, although many have been closed or are in private hands and so can only be admired from the outside. These include the Castello di Pescolanciano and the Castello di Monteroduni, both dating from the Middle Ages. 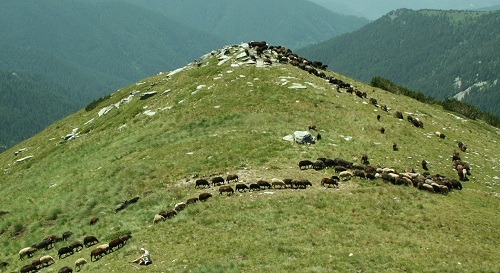 The territory has a rich heritage of the transhumance economy of past ages, when twice each year thousands and thousands of shepherds from Abruzzo and Molise traveled with millions of sheep down to the Apulian plains and then back to the mountain pastures: over 100 km of grass highways, 111 mt wide, crossing the landscape, and leaving their marks in the face of the land and the customs of the people. Capracotta is one of Molise's most well known ski slope, enthusiasts can also enjoy cross-country skiing, ski tours and Alpine style skiing. Unspoiled nature and a number of parks and reserves make the province of Isernia the ideal destination for trekking, horse-riding and cycling. Golf and paragliding are also available.Pot-holing enthusiasts will appreciate the wonderful Grotta di San Michele in Sant'Angelo in Grotte, in the municipality of Santa Maria del Molise. Lovers of handicrafts can discover some unique examples of ancient tradition, including vintage bagpipes, the bell foundry, knife-sharpening, lace work, and copper-working. The province of Isernia is a treasure trove for the valuable white and black truffles (tartufi). 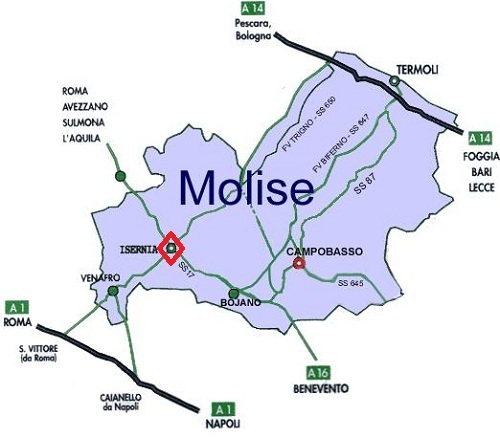 The farming and pastoral origins of Molise lend its cuisine simplicity and authenticity. Traditional dishes are crjoli (pasta shapes), cavatelli (potato and flour dumplings) with tomato and pork, laganelle, a type of lasagne with beans. Main dishes include roast turcinelli, lamb-based tripe. 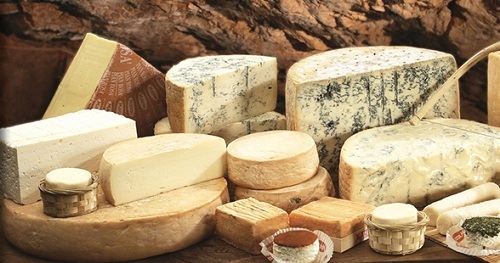 Also notable are the cured meats, sausages and brawn as well as the cheeses, such as caciocavallo, mozzarella and scamorze, stracciata, burrino and pecorino. A renowned speciality of Venafrois olive oil, produced widely in the province and of very high quality. Desserts are made from ingredients such as dried fruit, honey and pine nuts: typical are calzoni, pasta stuffed with chocolate, chickpeas, cinnamon, pine nuts and honey, pepatelli (with almonds), and caggiunitti (donuts filled with chestnuts). 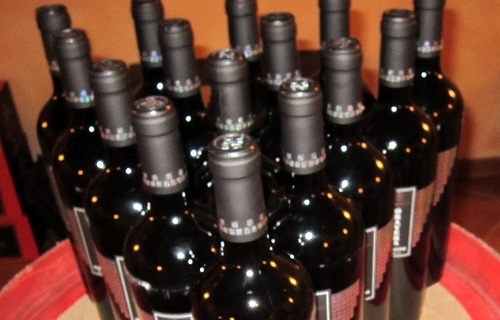 Quality wines include Biferno (white, red and rosé) and Pentro (white, red and rosé), both awarded DOC status. Typical liqueurs include Poncio (orange and mandarin flavour) and limoncello.